Arthritis Consumer Experts and The Arthritis Society, with the advice and support of Canada’s arthritis community have launched a national arthritis awareness program across Canada. The national program is composed of two phases: Phase One – a national and regional public and consumer outreach program, which started in mid-October and will run until January 2010; and Phase Two – a national and regional healthcare professional outreach program that will begin in February 2010 and end in September 2010. Launched in October 2009 and running through to September 2010, this 12-month national program is designed to talk to Canadians about arthritis. The national program will offer resources, workshops, support, and information. During the campaign, we will be reaching out to the general public, community leaders, media, healthcare professionals, and people with arthritis. Canadians must find a cure for arthritis. It’s likely that you, a member of your family, a friend or your neighbour is struggling with the severe pain and disability caused by this disease. Arthritis strikes young and old people alike and can cause deformity, reduced life expectancy and even death. People don’t talk about arthritis or realize how serious it is. Now is the time for us to raise awareness about arthritis and make a difference to the nearly 4.5 million Canadians who fight it every day. To start the conversation on arthritis, the arthritis community is “hitting the street” to debunk myths and educate Canadians about how arthritis affects our families and our working lives. While there is currently no cure for arthritis, dramatic advances in research over the past few decades have led to better treatments and hope for the future. Canada is a global leader in arthritis research. Sustained research efforts account for why people living with arthritis now have many treatment options – including surgery and medication – to manage their condition. These treatments, however, don’t work for everyone; treatments can stop being effective and there can be side effects. Not all people can access the treatments they need. More must be done. Particularly when you consider that arthritis affects 16% of the Canadian population – more adults than diabetes, cancer, heart disease, asthma or spinal cord trauma – but receives much less research funding than other chronic diseases. The Canadian Institute of Health Research spent $19 million – a comparatively small sum – on arthritis research in 2005–2006. 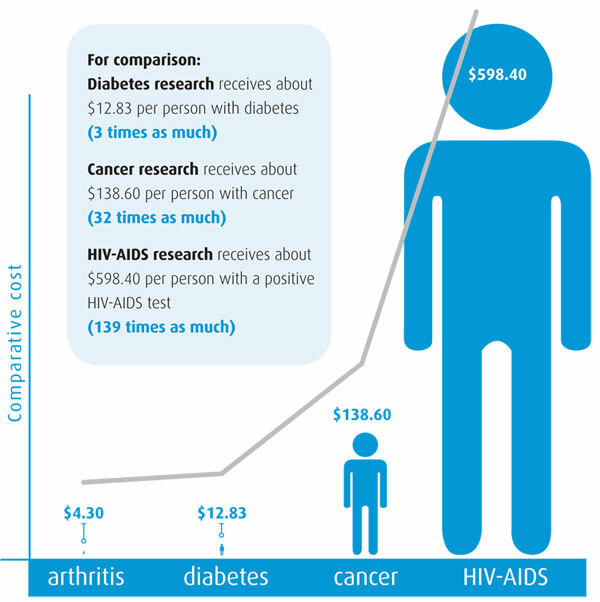 That is about $4.30 for every person living with arthritis in Canada – significantly less than many other diseases. More funding for arthritis research is critical if we are to better understand how to prevent, treat and find a cure for the more than 100 different types of arthritis. Arthritis is a debilitating condition that affects too many people to go unnoticed and untreated. If we work together, we can increase people’s understanding of this serious disease and show the importance of funding research to find better treatments and a cure. There are lots of ways to help change the face of arthritis in Canada. Here is how you can make a difference. Distribute materials in your community and workplace, and spread the word. These materials can be downloaded in the Resource Kit section at ArthritisIsCured.org for you to print in either colour or black and white. Send the video, also available on ArthritisIsCured.org, to your family, friends and colleagues, letting them know about the severe impact of arthritis. Link to the Facebook page, become a fan and tell your network about the significance of finding a cure for arthritis. Send an email from the website to tell someone about the “Arthritis is cured!” program and get the message out about this devastating disease. Help find a cure by donating to arthritis research. We hope you will join us on this ambitious and unprecedented program for arthritis awareness in Canada. Over the past 12 months, ACE received unrestricted grants-in-aid from: Abbott Laboratories Ltd., Amgen Canada / Wyeth Pharmaceuticals, Arthritis Research Centre of Canada, Bristol-Myers Squibb Canada, Canadian Institutes of Health Research, GlaxoSmithKline, Hoffman-La Roche Canada Ltd., Merck Frosst Canada, Pfizer Canada, Sanofi-aventis Canada Inc., Schering-Plough Canada, and UCB Pharma Canada Inc. ACE also receives unsolicited donations from its community members (people with arthritis) across Canada. The material contained on this web site is provided for general information only. This web site should not be relied on to suggest a course of treatment for a particular individual or as a substitute for consultation with qualified health professionals who are familiar with your individual medical needs. Should you have any health care related questions, you should contact your physician. You should never disregard medical advice or delay in seeking it because of something you have read on this or any web site. Although the information presented on this web site is believed to be accurate at the time it is posted, this web site could include inaccuracies, typographical errors or out-of-date information. This web site may be changed at any time without prior notice.